An expert lock picker claims nearly everyone who comes to the upcoming event in Logan Square will be able to successfully pick a lock before leaving. LOGAN SQUARE — By the end of next weekend's lock-centric event, renowned lock picker Schuyler Towne nearly guarantees every person in the building will be able to crack open a basic lock. Towne, who refers to himself as a security anthropologist, will be at the Stan Mansion in Logan Square leading demonstrations on how to pick a lock during an Art of Lock Picking party. "Honestly, I think the people are going to get a lock open," he said. "I'm very confident in that." Towne is one of the original American Locksporters, a sport that picks lock purely for the sake of picking. "At some point you need to establish that sense of touch," he said. "The ability to see through your fingers. That takes a lot of progress." 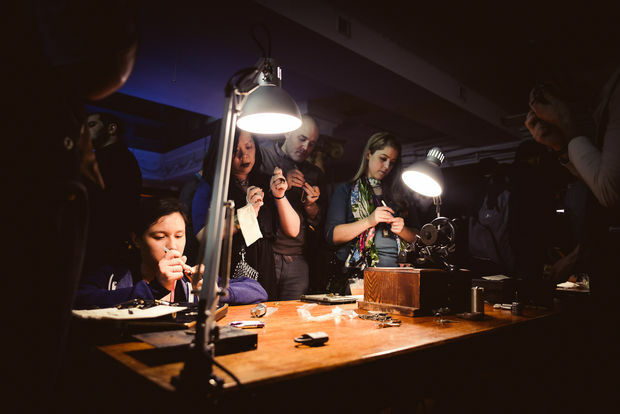 The celebration of lock picking event is being put on by Atlas Obscura on Sept. 30 and will include cocktails, live music, "19th century splendor" and plenty of lock picking. Towne will be giving a demonstration on his skills while sharing tricks of the trade to attendees. He is also bringing along his collection of vintage locks. Everyone will get a chance to work with lock-picking tools and try their hand on a variety of different lock types. Some will be de-pinned to make the picking easier at first. The basic locks participants will be working on include an off-the-shelf door lock or padlock. "Frankly, I'm not the fastest lock picker in the world anymore, but I dedicated myself for years how to teach people effectively how to pick," Towne said. There will also be some high-security locks for attendees to test their skills on, although it will be highly unlikely anyone without experience will be able to crack them, Towne said. The big question is whether what Towne is teaching will be used for harm. His response is that burglars don't pick a lock if it takes too long; they simply smash a window instead. "Obviously the things that we teach can absolutely be used for harm by other people," he admitted. That's not the point, Towne said. The point is solving complex mechanisms. "The joy of it is in the puzzle," Towne said. "There's so much in a lock, mechanically, intellectually and socially. I just take such joy figuring them out and explaining them to other people." Towne is bringing three salesmen samples from the 1840s that will show the complex operations of the locks of that era. The big event costs $100 per person and will include an open bar, music by Brian O'Hern and the Model Citizens Big Band and entertainment by Charlie Scarlet and Lady Ginger at 2408 N. Kedzie Ave.